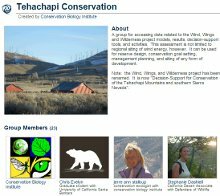 We encourage you to use Data Basin to make a positive difference for the well-being of people, wildlife, and natural landscapes. Click on the "Sign Up" link in the top right to create a free account. 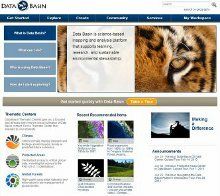 You can also sign in to Data Basin using an existing Google, Facebook, or Yahoo account. 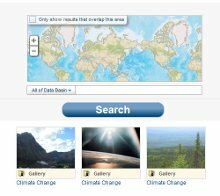 Datasets contain local, regional, and global geospatial information. You can find biological, physical and socio-economic information. A dataset could be coordinates where a bird species has been observed, boundaries of land managed in various ways (e.g., US Forest Service), a thematic image of vegetation types, or the results of a model that shows changes in the habitat distribution of a species under different climate change scenarios. A large and continually growing body of datasets, including both raw data (e.g., monitoring data on temperature and precipitation, road networks) and analytical results (e.g., projected changes in suitability for a species or ecosystem, interpretations, or recommendations), is included. CA Offshore Wind Energy is more than a data portal or map viewer. CA Offshore Wind Energy is a powerful web-mapping and analysis platform that integrates credible data, social networks, and decision-support tools. CA Offshore Wind Energy is distinguished by both the high quality of content and the method of organization. 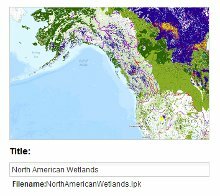 The platform is designed to be approachable to casual GIS users (e.g., biologists, resource managers, program coordinators, policy advisors, researchers, interested citizens), as well as a useful publishing platform for power GIS users. 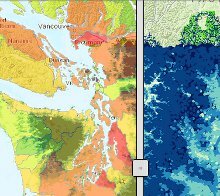 Datasets are spatial information, typically created using a Geographic Information System (GIS). 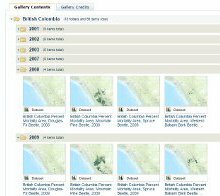 Supported dataset formats include shapefiles, ArcGRID files, ESRI File Geodatabases, and NetCDF files. Datasets can be styled, analyzed, and downloaded. 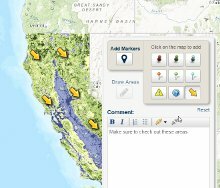 Maps are created by members and are overlays of spatial information, including datasets, drawings, and basemaps. A map can be thought of as an "idea" you want to illustrate. Maps can be explored, saved as a new item, and exported in a variety of formats (e.g., png, ppt, pdf). The primary search field is located in the top right of the page. Type a keyword or place name and hit return to find public datasets, maps, galleries, people or groups. Enter phrases in quotes and try both singular and plural forms of your keyword for better search results. Under the top right search box is an option to "search by geography". Use the map to define your area (pan and zoom) of interest and hit search (limited to datasets and maps). 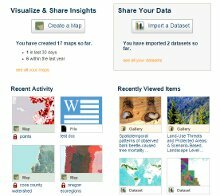 Maps are created by members and consist of one or more datasets, drawings, or basemaps. In the main navigation bar under "Create", click on "Create a Map." You have loaded an empty basemap. To visualize the distribution of something you are interested in, click on the "Layer" tab on the upper left hand corner, select "Datasets" and click "Add datasets". Search for your topic, select a dataset, and click "Add items" on the bottom of the page. Use the search field in the top right of page to find a dataset or map that you wish to view. Click on the title to view the overview page. Click open in map to launch the mapping tool. Click on the "Layer" tab in the upper left hand corner, select "Drawings", "Datasets" or "Basemaps" to add datasets, drawings, basemaps, and styles to your map. You can pan, zoom, identify and conduct basic operations using the tool bar at the top of the map. To save or export your map, you must be signed in. Contact us and we can work with you to publish a case study or guide. To contribute your datasets, contact us to request upload permissions. After your permissions have been changed to allow for upload, you will be walked through several steps to enter information about your dataset. If valid FGDC metadata is found with the upload, it will be used to help populate these steps. Datasets must be ESRI Shapefile, File Geodatabase, or ArcGRID formats inside a layer package file (.lpk). 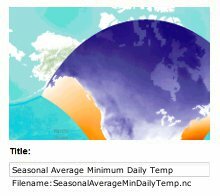 Datasets must be in standard projection based on the following Datums: WGS84, NAD83, South American 1969, European 1950. Upload file must be less than 250 MB. We recommend keeping files less than 150 MB for best performance. Map services can also be uploaded if they are hosted on ArcGIS Server 9.3 or later. Tiled map services must be in the Web Mercator Projection. The upload file must be less than 250 MB. We recommend keeping files less than 150 MB for best performance. The file size limits are based on the compressed size of the layer package. The uncompressed size can be much larger (up to 4 GB for rasters). non-solid fills for polygons (e.g., crosshatches). These make it more than 2x as slow to draw due to constraints external to the system. Each member is provided 1 GB of free data hosting. Contact us if you would like to purchase additional storage space. 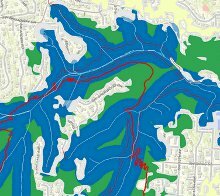 Individuals and organizations can access additional analysis capabilities by subscribing to Premium Mapping and Analysis. More information can be found here. The function of exporting a subset of a dataset is a premium tool. Individuals and organizations can receive powerful analysis capabilities by subscribing to Premium Mapping and Analysis. More information can be found here. Please contact us to let us know more information about your situation and we'll investigate. Details about our training and workshops are available on the Services page. Use the contact form on that page to request more information. Contact us with questions or comments by using the online contact form.